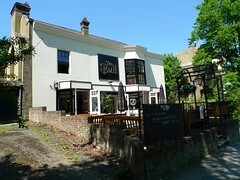 Pub and microbrewery in Highgate. According to the Oct/Nov 2016 London Drinker, it underwent a change of management in July 2016, and is now owned by the same people as the Prince Arthur in London Fields. We haven't visited since then, so some of the details below may be out of date. However, the London Drinker piece states that the in-house brewing "should continue". This is a large and spacious pub, which is divided into two rooms upon entering -- to the right is the bar area, while to the rear is the kitchen. Tables of various sizes, some quite large, are arrayed along the front of the building with smaller ones to the sides and some large couches nestled around the rear. There's also a separate dining room and an upstairs room, all bookable for private functions. Out of the front of the pub is further space with tables, on a broad patio away from the street level and sheltered by vines and plants. The main bar has six handpulls, four of which were offering the pub's own beer on Ewan's September 2013 visit, along with one guest ale and one cider. These beers are also notified on a chalk board with the names, styles, alcohol percentages and prices (most being £3.50, though the 4% best bitter was £3.30/pint and the higher percentage 5% American-style IPA was £3.70). The kegs are a range of familiar basics like Grolsch, as well as 'craft' beers including Camden Town Pale Ale, Gentleman's Wit and Ink, Sierra Nevada, Liefmans, Veltins and Aspall's cider. There is also a large fridge full of interesting beers, mainly from the US, both small and large bottles. Food is offered noon-10pm all days except Sunday, when the kitchen closes at 9pm. Ewan hasn't sampled this but the menu looks to be a good range of upmarket familiar dishes priced around £10-12 for a main. There was also a plate of large and chunky sausage rolls (£2.50) at the side of the bar on Ewan's visit. The atmosphere is pleasant late on a weekday evening, and while music was playing, it didn't get in the way of conversations. Staff are friendly, and there's free wifi (you can ask for the password). A large pile of boardgames sits on a windowsill in the pub's corner. Accessibility: There are steps to get up to the pub from street level, but once inside the toilets are on the same level as the bar. Last visited by Ewan, September 2013. Opening hours and food times taken from website, September 2013. Last edited 2017-03-15 19:07:08 (version 9; diff). List all versions. Page last edited 2017-03-15 19:07:08 (version 9).